FLIR FX allows you to mix and match camera accessories for a variety of video monitoring applications such as outdoor security, home monitoring, recording in a vehicle, sports recording, and more. With a wide range of applications and purpose-driven features, FLIR FX is a flexible video monitoring solution that changes to suit your video monitoring needs. Please refer to the FLIRSECURE website for the Quick Start Guide. Professionally Monitor Your Office or Home With this 2.1 megapixel, high-density IP camera from FLIR, you can get professional-level surveillance of your home or business. This camera uses advanced dual-streaming technology to provide you with high-resolution images at a rate of 30 frames per second. Onboard storage via microSD allows you to record and save images as needed. 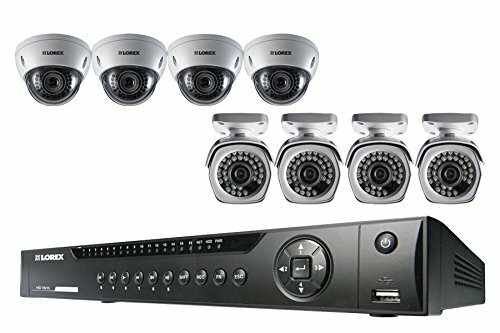 The camera is compatible with other popular third-party surveillance software for integration with your security system. A 3.6-millimeter wide-angle lens and 1920 x 1080 resolution provide you with law enforcement-grade images that can be used as you see fit. View your footage from anywhere with an Internet-connected device. The durable cable-through-bracket design is placed within an aluminum housing to resist vandalism and the weather. With 64-channel CMS and Sony Exmor CMOS Progressive Scan technology built into the camera, your streaming video will be secure. You can control this system from a distance by downloading a mobile app for your iPhone, iPad or Android smartphone. This system is Onvif 2.1 compliant, backwards compatible and easy to install with a simple bracket system. 8-Channel HD NVR with Weatherproof IP Cameras Experience the next generation of premium, do-it-yourself security with the LNR400 Series Network Video Recorder (NVR). 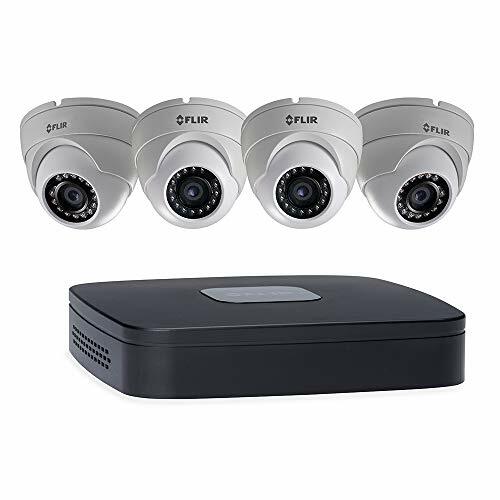 This cutting-edge NVR is bundled with weatherproof HD IP cameras to provide you with stunning 1080p HD recording in real-time on all channels. Each camera requires just a single Ethernet cable connecting it to the NVR, which provides both power and video using Power over Ethernet (PoE) technology. Connect the cameras to the NVR's 8 integrated PoE ports for a truly plug-and-play surveillance experience that will have you up and running in no time. A high-capacity security-grade HDD is pre-installed, allowing you to record days of footage as lifelike as life itself. Maintain vigilance with the ultimate in recording resolution and picture quality in your corner. View your World in HDWhen you can't be there in person to keeps a watchful eye on your residence and family the next best is this premium analog surveillance system from Lorex.  the LHV100082TC8PM records video in 720p HD on all 8 channels in real-time, or twice that of 960H standard. 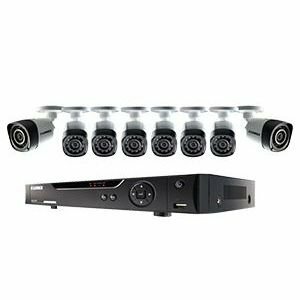 The 8 feature-laden MegaPixel camera connect to the DVR using standard BNC locking cables and seamlessly send high-quality HD images for your review. Protect yourself and view the world around you with best-in-class video that delivers dynamic detail via impressive optics. Experience the gold standard in analog surveillance video that is second only to being there yourself. 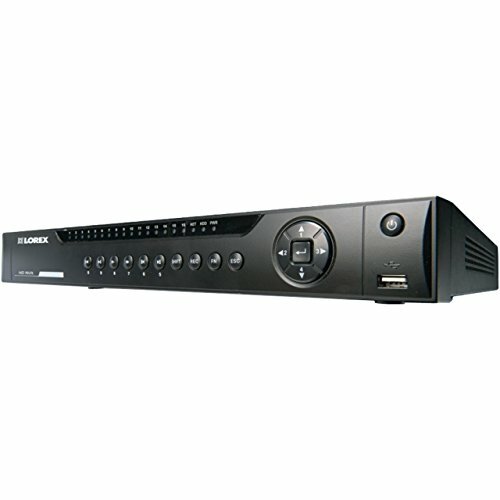 This HD DVR records video in real-time at 720p HD, double the resolution of 960H, on all 4 channels. Including 4 fully-loaded megapixel security cameras, this system uses standard BNC cabling to transmit stunning HD images for a surveillance experience like no other. Maintain vigilance with best-in-class image quality and view your world with new eyes. Crystal Clear Video No Matter Where You Are This 2.1MP Dome Network Internet Camera is designed to provide you with a constant audio and video stream of your home or business property. For the best picture quality, this surveillance camera features HD 1080p images and records 30 frames per second. The lens' IR feature provides clear images even in the dark up to an amazing 100 feet. For a crisp picture, the varifocal lens can zoom between 3.3mm and 12mm. You can back up this camera and keep footage on a MicroSD card or upload the data to your computer. Since this dome network camera is compatible with the iPhone, iPad and Android operating systems, you can use it in conjunction with your favorite mobile device. To provide you with sound, this surveillance camera supports two-way audio. With "future-proof" 2.1 compliance, this Internet camera will provide years of service. The three-axis design makes for simple mounting on a wall or ceiling and provides excellent coverage. Its IP66-rated housing is suitable for any weather conditions; perfect for protecting a parking lot or building exterior. Monitor your home or office with this professional surveillance system. The FLIR FX Outdoor is a versatile wireless HD camera that allows you to keep an eye on the things that are important to you - anytime, any place. Monitor a package delivery to your doorstep, ensure your home is secure when you’re away, or safely identify the source of that suspicious noise you heard outside at night. Please refer to the FLIRSECURE website for the Quick Start Guide. Monitor Your Property in Vibrant HD This 2.1 megapixel surveillance camera offers all the professional-level features you need to monitor your home or work environment. The removable IR filter allows you to use this camera in day and night lighting conditions. Its 1920 x 1080 resolution provides a clear picture taken at an astounding 30 frames per second. A wide angle, 3.6 millimeter lens provides a wide perspective and patrols the area at 360 degrees. This IP camera features a MicroSD card backup, ensuring that all images captured by the camera are stored for future reference. The software controlling this camera is compatible with other third party software used by your security system. To monitor the premises from afar, you can download mobile apps and check in on things using your iPad, iPhone or Android. Your home or business is never more than a click away with this pro IP camera from FLIR. Not only does the camera support two-way audio, it also features a weatherproof and vandal-resistant housing. The system's software works in all major browsers, including IE, Firefox, iOS and Chrome, so matter what you use, this camera is compatible with your needs. 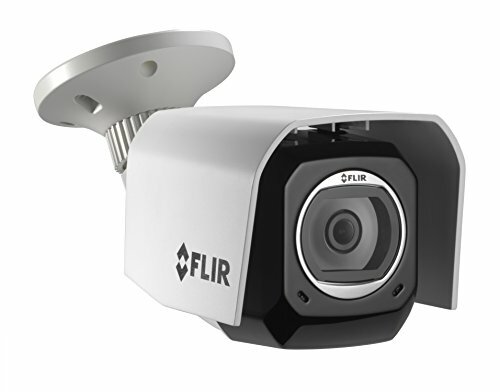 Professional Monitoring Made Easy For monitoring the interior or exterior of your home or business, this IP camera from FLIR is as good as it gets. Its motorized varifocal lens provides zoom capacity to focus on faraway areas, objects or activities, automatically adjusting to the action and saving valuable maintenance and unnecessary downtime. You don't even have to be on or near the site to perform these critical adjustments; through the online platform you can not only make necessary changes, but you can also watch your video from any device with an Internet connection. The device's weatherproof casing protects the inner mechanisms and provides long-lasting, excellent performance for all seasons and conditions. Other useful features include power over ethernet, which frees the camera to be installed most anywhere with a single wire. This feature also ensures continuous operation and control. The camera has an exceptional 1080p HD resolution and infrared night vision detection range of 80 feet. This IP camera also includes microSD format recording and removable storage for enhanced footage collection. 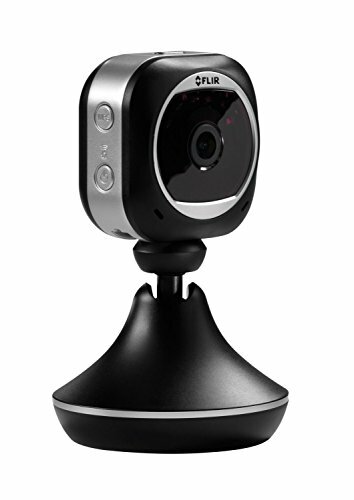 Professional monitoring has never been easier than with this full-featured IP cam from FLIR. 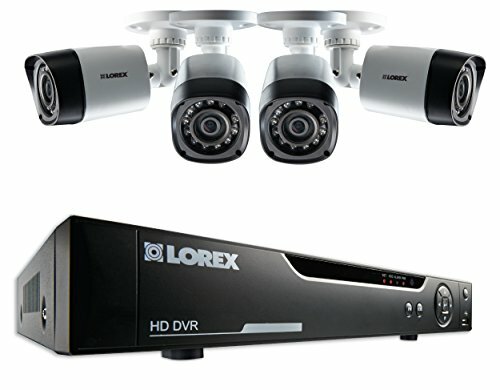 The Lorex 8-Channel 1080p HD NVR System with Pre-Installed 2TB HDD & 8 PoE Inputs is the solution to your surveillance needs. With free FLIR Cloud smartphone and tablet apps, stay connected with live viewing, playback, video recording and snap shot for Android and iOS smartphones and tablets. The system features real-time 1080p HD recording, PoE to eight channels, HDMI and VGA outputs, and two USB ports. The system supports Lorex PTZ HD cameras and includes 100VAC-240VAC, 50/60Hz power adapter, NVR with pre-installed HDD, HDMI cable, remote, mouse, Ethernet cable and quick start guide. The FLIR FX Will Change the Way You See Portable and powerful, the FLIR FX is the most versatile cloud-based camera on the market. Keep an eye on your home or business from anywhere in the world using the exclusive FLIR iPhone, iPad, and Android apps. The revolutionary RapidRecap feature lets you see a day in a minute: The FLIR FX will capture all movement and superimpose it into one frame, allowing you to see multiple events simultaneously, drastically cutting down security footage review time. SmartZone technology enables you to specify exact areas of the video frame so you're only alerted when specific motion is detected. Setup is simple and intuitive, having you up and running in minutes.As for the camera itself, the FLIR FX features a top-of-the-line four megapixel CMOS image sensor enabling full 1080p HD resolution. The camera's wide 160-degree field of view is perfect for monitoring a large space like a warehouse. And, with six IR LEDs, you're guaranteed quality footage in any lighting conditions. Two-way audio make the FLIR FX ideal for use as a nanny cam. And, even though you're able to stream your video live, on-board microSD storage (up to 64GB, not included) enables you to always have a backup of your footage. What really sets the FLIR FX apart from comparable cameras, however, is its host of accessories. Choose an action cam mount and take on-the-go footage of your latest bike trip, or select a dash mount to always have a record of your time behind the wheel. There's even an optional housing that makes the FLIR FX a traditional outdoor security camera. Anything you could possibly need to record, the FLIR FX can do it. This camera comes with 1 year of service including 2-day storage, 3 RapidRecaps, and 6-hour max recap. Higher-capacity storage plans are available. Please consult your owners manual for details and ordering information.